INDIANAPOLIS – They call him the “hunter”. 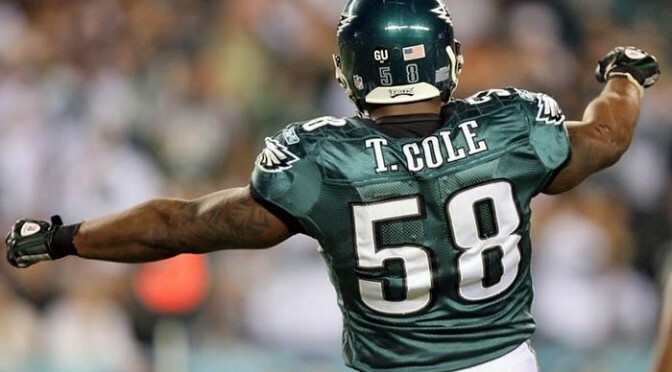 Trent Cole, that is, the new Colts outside linebacker. During Cole’s recent free agency process, the man who thoroughly enjoys the outdoor thrills of doing the hunting was now the hunted. It was the Colts who were hunting Cole and, for a rare time, the 32-year old Ohio native enjoyed being on the other side of things. At first, an “exhausting” process for Cole changed when he got word of which team was about to enter the hunt. “When I heard that the Colts wanted to bring me in, that threw a flag up for me, I know about that team. I know what they can do. I know what type of quarterback they got,” Cole thought. The intrigue of the Colts as Cole’s next NFL stop increased after a talk with his former teammate Todd Herremans. On the Sunday before free agency began, Herremans (who, just like Cole, played the previous 10 seasons with the Eagles) signed with the Colts. It didn’t take long for Cole and Herremans to explore the possibility of reconvening in Indianapolis. “As soon as I heard Todd had signed, I kind of just fed off what Todd said about the organization,” Cole said. Two days later, everything was finalized for the Colts and Cole. In Cole, the Colts have acquired an edge rusher who has had at least 5.0 sacks in nine of his 10 seasons. He’s missed just five games out of 160 career contests. Entering 2015, the Colts now have five different edge rushers who have played starting-level roles throughout their respective NFL careers. Cole made that group a handful last week and the 33-year old feels that life at his age in a 3-4 scheme has added some years to his game. “I have a lot of gas in the tank,” Cole said last week. “The Colts and the other teams that were after me, that tells you something. That tells you that this guy has a lot left in him, that he can be an impact to the team.